Hollis JohnsonKellogg’s is opening a cereal café in NYC. 1. Chase has called in auditors to scrutinize its relationship with Publicis Groupe media agency ZenithOptimedia — the company which buys its advertising. Business Insider learned that the decision by the consumer and commercial banking division of JPMorgan is a direct response to the high-profile report published earlier this month by the Association of National Advertisers. 3. Google is about to ask all its users if they want to opt in to “ads personalisation.” The change will allow Google to start using data it has about you from Search, Chrome, and YouTube to give you more personalised ads. 4. Snapchat is reportedly making its ad prices more reasonable for brands. A brand’s minimum spend on ads could be reduced from $500,000 to $100,000 — to address concerns from companies using the platform to promote products and services, according to Digiday. 5. The Washington Post hopes to add $100 million in annual revenue through selling software, including the site’s content management system. So far around a dozen smaller news organisations are using The Washington Post’s software. 6. Google could face another antitrust charge from the EU next month. The issue relates to Google’s AdWords ad placement service — rivals have previously complained about unfair advertising exclusivity clauses and undue restrictions on advertisers. 7. These are the top 30 Vine stars in the world. These Vine users used the platform to rise from relative obscurity to be followed by millions of people — they can teach valuable lessons to brands looking to do the same. 8. 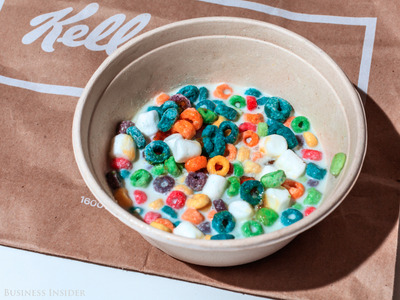 We tried out Kellogg’s new restaurant in New York which charges more than $7 for cereal. The menu for the café, which opens to the public on July 4th, was created by Milkbar’s Christina Tosi. 9. Chiptopia — Chipotle’s new rewards program — offers the the best rewards in the market according to BTIG analyst Peter Saleh. However, the catch in the program is that it is temporary, lasting only three months. 10. The way painkillers are advertised in the UK may have to change after a landmark ruling. The UK’s Advertising Standards Authority has banned an ad by Nurofen for claiming it could target specific types of pain, according to The Guardian.